Case Keenum, meanwhile, threw two costly picks for the Broncos and was sacked on fourth-and-10 in the final minute, ending his team’s comeback bid. 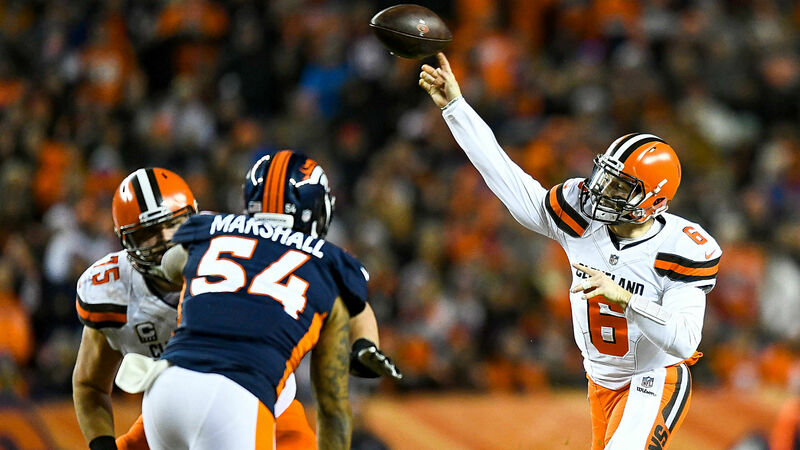 11:28 p.m. — Final: Browns 17, Broncos 16. 11:27 p.m. — Peppers sacks Keenum on fourth-and-10 to effectively end the game. 11:17 p.m. — The Browns DO go for it on fourth-and-1 inside the 10, and they don’t get it. Coach Gregg Williams had called timeout just before a Broncos neutral zone infraction would have been called to move the chains. 11:05 p.m. — FIELD GOAL, Broncos . Denver decides not to go for it on fourth-and-1 inside the 10, instead taking a delay of game and kicking a field goal. That will be a scrutinized decision if the Browns win. 17-16, Browns. 10:48 p.m. — TOUCHDOWN, Browns . Mayfield gives Cleveland the fourth-quarter lead. 17-13, Browns. 10:44 p.m. — End of third quarter. 10:40 p.m. — Keenum is picked again.
. @tj_carrie hauls in the @Browns ‘ second interception of the game! #Browns trail 13-10 with 14:41 left in the 4th quarter. 10:37 p.m. — Von Miller just became the Broncos’ all-time sacks leader. 10:34 p.m. — Broncos defensive back Jamar Taylor has been ejected for throwing a punch at Browns wide receiver Breshad Perriman. 10:24 p.m. — FIELD GOAL, Broncos. Denver regains the lead late in the third quarter. 13-10, Broncos. 10:15 p.m. — Mayfield fumbles the ball and Denver recovers. That’s his second turnover of the game. 10:01 p.m. — The second half is underway with the Browns in possession. 9:46 p.m. — Now Mayfield overthrows a deep ball down the seam and is intercepted. That should lead us into the half at 10-10. 9:33 p.m. — Interception. Jabrill Peppers picks off Keenum in the end zone. 9:23 p.m. — FIELD GOAL, Browns. The defensive holding helps the Browns tie the game. There are just under five minutes left in the half. 10-10. 9:20 p.m. — Mayfield is sacked out of field range, but a defensive holding call gives the Browns an automatic first down. That’s a big break for Cleveland. 9:11 p.m. — FIELD GOAL, Broncos. Brandon McManus hits a 44-yard field goal. 10-7, Broncos. 9:07 p.m. — Following a Browns punt, the Broncos are driving once again. They’ve looked much better during the past two drives. 9:01 p.m. — End of first quarter. 8:59 p.m. — Mayfield converts a third-and-13 with a pass over the middle to tight end David Njoku. 8:49 p.m. — TOUCHDOWN, Broncos. Case Keenum takes it in himself. 7-7. 8:48 p.m. — A pass interference call gives the Broncos first-and-goal. 8:46 p.m. — Broncos running back Philip Lindsay bursts through the hole for a first down in Browns territory. 8:39 p.m. — The teams exchange punts, and we still haven’t had a sustained drive. The Browns scored earlier after starting around the 50. 8:28 p.m. — TOUCHDOWN, Browns. Mayfield finds Breshad Perriman with a dime on third down. 7-0, Browns. PERFECT throw! @BakerMayfield to @B_Perriman11 for the #Browns TD! 8:24 p.m. — Denver moves backward on its first drive. The Browns receive the ensuing punt near midfield. 8:20 p.m. — This game is about to get underway. The Broncos will start with the ball. 7:34 p.m. — Here are the inactives for each team.